شهبازی کرمی, جواد, شیخی, محمد مراد, پایگانه, غلامحسن, ملک زاده, کرامت. (1396). بررسی مقایسه‌ای شکل‌دهی سرد و داغ لوله‌های کامپوزیت فلزی مس-آلومینیوم توسط فرآیندهای شکل‌دهی هیدروفرمینگ و گازفرمینگ. علوم و فناوری کامپوزیت, 4(2), 205-218. جواد شهبازی کرمی; محمد مراد شیخی; غلامحسن پایگانه; کرامت ملک زاده. "بررسی مقایسه‌ای شکل‌دهی سرد و داغ لوله‌های کامپوزیت فلزی مس-آلومینیوم توسط فرآیندهای شکل‌دهی هیدروفرمینگ و گازفرمینگ". علوم و فناوری کامپوزیت, 4, 2, 1396, 205-218. شهبازی کرمی, جواد, شیخی, محمد مراد, پایگانه, غلامحسن, ملک زاده, کرامت. (1396). 'بررسی مقایسه‌ای شکل‌دهی سرد و داغ لوله‌های کامپوزیت فلزی مس-آلومینیوم توسط فرآیندهای شکل‌دهی هیدروفرمینگ و گازفرمینگ', علوم و فناوری کامپوزیت, 4(2), pp. 205-218. شهبازی کرمی, جواد, شیخی, محمد مراد, پایگانه, غلامحسن, ملک زاده, کرامت. بررسی مقایسه‌ای شکل‌دهی سرد و داغ لوله‌های کامپوزیت فلزی مس-آلومینیوم توسط فرآیندهای شکل‌دهی هیدروفرمینگ و گازفرمینگ. علوم و فناوری کامپوزیت, 1396; 4(2): 205-218. امروزه شکل‌دهی لوله‌های چندلایه با توجه به کاربرد گسترده آن در صنایع هوافضا، نفت و پتروشیمی و بررسی شکل‌پذیری آن توسط فرآیندهای مختلف شکل‌دهی مورد توجه محققان قرارگرفته است. در این پژوهش بررسی مقایسه‌ای شکل‌پذیری لوله‌های دولایه کامپوزیت فلزی در فرآیند شکل‌دهی سرد و داغ در یک الگوی هندسی بالج قالب بسته، تحت تأثیر شرایط فرآیندی آزمایش هیدروفرمینگ و دمش گاز مورد مطالعه قرارگرفته است، به‌طوری‌که نحوه عملکرد هریک از فرآیندها در شکل‌دهی لوله‌های دولایه مس (داخل)- آلمینیوم (خارج)، بر میزان چروکیدگی، پارگی، کمانش و کنترل توزیع ضخامت در محدوده پروفیل قالب بالج شکل، در حالت‌های مختلف مورد بررسی قرارگرفته است. فرآیند هیدروفرمینگ در دمای محیط و ماکزیمم فشار 300 بار انجام شده است. همچنین فرآیند دمش گاز در دمای 550 درجه سانتیگراد و فشار 40 بار صورت پذیرفته است. نسبت انبساط لوله دولایه در فرآیند دمش گاز، در حالت مقایسه­ای با فرآیند هیدروفرمینگ به میزان 1.35 درصد افزایش و قبل از پرشدگی قالب دچار ترکیدگی شده است. نمونه سالم بالج قالب بسته در فرآیند هیدروفرمینگ با فشار شکل­دهی 280 بار و الگوی بارگذاری خطی 6 میلی متر، ماکزیمم نازک­شدگی به مقدار 1.65 میلی متر شکل داده شده است. Nowadays the formability of multi-layered tubes through different kinds of forming processes has been of interest to researchers due to its vast applications in aerospace, oil and petrochemical industries. This study compares cold forming and hot forming of bi-layered composite tubes via hydroforming and gas blow forming the tubes in geometrical model of a closed die bulge. The effect of these forming processes operational conditions on the bi-layered copper (inside) – aluminum (outside) tubes forming, wrinkling, bursting, buckling and the thickness distribution controlling on the die profile region in various situations were investigated. Hydroforming process was executed at ambient temperature with the maximum pressure of 300 bar. The process of blow gas forming at 550 ° C temperature and 40 bar pressure was implemented. The expansion ratio of the bi-layered tube during the gas blow forming process exceeded 1.35 % in comparison that of hydroforming process. In addition, the die experienced burst before the fitting during the gas blow forming process. The undamaged closed die bulge was formed through 280 bar hydroforming process with the conditions of 6 mm linear loading and 1.65 mm maximum thinning. Islam. M.D, Olabi. A.G, Hashmi. M.S.J, “Feasibility of multi-layered tubular components forming by hydroforming and finite element simulation”, Journal of Materials Processing Technology Vol. 2, No. 3, pp.174, 394–398.2006. Seyedkashi. S.M.H, Liaghat. Gh, Moslemi Naeini. H, Mahdavian S.M., Gollo M.H., “Numerical and experimental study of two-layered tube forming by hydroforming process”, Advanced Materials Research, Vol. 2, No. 1, pp. 264–265, 2011. Harjinder. S, “Fundamentals of Hydroforming, Society of Manufacturing Engineers”, 2003. Alaswad. A., Benyounis. K.Y., Olabi. A.G., “Finite element comparison of single and bi-layered tube hydroforming processes”, Materials & Design, Vol. 32, No. 2,pp.10-20, 2011. Hashmi. M.S.J., Islam. M.D., Olabi. A. G., “Experimental and finite element simulation of formability and failures in multilayered tubular components”, of Achievements in Materials and Manufacturing Engineering, Vol. 24, No. 1, pp.1-10, 2007. Alaswad. A., Benyounis. K.Y., Olabi. A.G., “Employment of finite element analysis and Response Surface Methodology to investigate the geometrical factors in T-type bi-layered tube hydroforming”, Advances in Engineering Software, Vol. 42, No. 11, pp. 917-926, 2011. Yi. H. K., Pavlina. E. J., Van Tyne. C. J., Moon. Y. H., “Application of a combined heating system for the warm hydroforming of lightweight alloy tubes”, Journal of Materials Processing Technology, Vol. 203, No. 1–3, pp. 532-536, 2008. Ze-jun. T., Gang. L., Zhu-bin. H., Shi-jian. Y., “Wrinkling behavior of magnesium alloy tube in warm hydroforming”, Transactions of Nonferrous Metals Society of China, Vol. 20, No. 7, pp. 1288-1293, 2010. Hwang. Y.M. , Su. Y.H. and Chen. B.J., “Tube Hydroforming of Magnesium Alloys at Elevated Temperatures”, Journal of Engineering Materials and Technology, Vol. 132, No.3, pp. 031012, 2010. Hashemi. S. Moslemi Naeini. J., H., Liaghat. Gh., Shahbazi Karami J., Roohi. 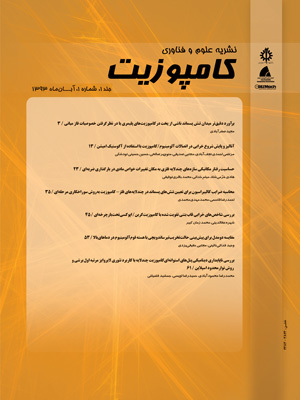 A. H., “Prediction of Bursting in Warm Tube Hydroforming using Modified Ductile Fracture Criteria”, In Persian, Modares Mechanical Engineering, Vol. 14, No. 16, pp. 201-211, 2015. Hosseinipour. S. J., Kargar Pishbijari. H., Shahbazi-Karami. J., “Experimental comparison of the formability of single-layer aluminum tubes and twolayer copper-aluminum tubes in the hot gas blow forming process”, In Persian, Iranian Journal of Manufacturing Engineering, Vol. 2, No. 4, pp. 36-46, 2016. Parto D. M.; Seyedkashi, S. M. H.; Liaghat, Gh. ; Naeini, H. Moslemi; Panahizadeh R. V., “Investigation of aluminum-copper tube hydroforming with axial feeding”, SOURCE AIP Conference Proceedings, Vol. 1315, No.1, pp. 475-480. 2011. Loh-Mousavi. M., Mirhosseini. A. M., Amirian. G., “Investigation of Modified Bi-Layered Tube Hydroforming by Pulsating Pressure", Key Engineering Materials”, Vol. 486, No. 5, pp. 5-8, 2011. Seyedkashi. S.M.H., Liaghat. Gh., Moslemi Naeini. H., “Numerical and Experimental Study of Two-Layered Tube Forming by Hydroforming Process”, Advanced Materials Research ,Vol. 264-265, No. 1, pp. 102-107, 2011. Alaswad. A., Benyounis. K.Y., Olabi. A.G. , “Finite element comparison of single and bi-layered tube hydroforming processes”, Materials & Design, Vol. 32, No. 2, pp. 1-10, 2011. Islam. M.D., Olabi. A.G., Hashmi. M.S.J., “Feasibility of multi-layered tubular components forming by hydroforming and finite element simulation”, Journal of Materials Processing Technology,, Volume 174, Issues 1–3, 2006. Islam. M.D., Olabi. A.G, Hashmi. M.S.J., “Mechanical stresses in the multilayered T-branch hydroforming: numerical simulation”, Int. J. Manufacturing Technology and Management, Vol. 15, No. 2, pp. 10-20, 2008. Payganeh. Gh., Shahbazi Karami. J., Malekzadeh Fard. K., “Finite element comparison of single, bi-layered and three-layered tube hydroforming processes”, JCARME, Vol. 2, No. 2, pp. 10-20, 2013. Shahbazi Karami. J., Malekzadeh. K., Payganeh. G., “Study of geometrical parameters on hydroforming of a new three-layered sandwich tube and finite element simulation”, International Conference on Mechanical, “Automotive and Materials Engineering (ICMAME'2012), Jan. 7-8, 2012. Hwang. Y., Chen. W., “Analysis of tube hydroforming in a square cross sectional die, International Journal of Plasticity”, Vol. 21, No. 9, pp.10-20, 2005. Moslemi Naeini. H., Liaghat. Gh., Hashemi Ghiri. S.J., Seyedkashi. S.M.H., “FE Simulation and Experimental Study of Tube Hydroforming Process for AA1050 Alloy at various temperatures”, Advanced Materials Research, Vol. 264-265, No. 5, pp. 96-101, 2011. Liu. G., Wu. Y., Wang. D., Yuan. S., “Effect of feeding length on deforming behavior of Ti-3Al-2.5 V tubular components prepared by tube gas forming at elevated temperature”, International Journal of Advanced Manufacturing Technology, Vol. 81, No. 9, pp.10-20, 2015. Michieletto. F., Ghiotti. A., Bruschi. S., “Novel experimental set-up to test tubes formability at elevated temperatures”, Key Engineering Materials, Vols 611-612, No. 6, pp. 62-69,.2014.